In what is a major step in terms of growth for the brand, contemporary fine jewellery designer Tessa Packard will open her very first London showroom in October. Located in Chelsea, a stone’s throw away from Sloane Street, one of the world’s ultimate luxury shopping destinations, the by-appointment-only showroom on Ives Street will offer clients a beautifully designed space to not only see Tessa’s contemporary fine jewellery collections in situ, but to meet with the designer one on one to discuss bespoke commissions. “This autumn marks four and a half years since I first launched the brand back in 2013 and we’ve finally reached a point in that journey where we need a stand-alone space and destination to offer our clients,” says Tessa. To coincide with the new showroom, October will also see the launch of Emperor’s New Clothes, the new collection from Tessa Packard London, which is inspired by the world of high-carat weight jewellery and record-breaking stones. Drawing its name from Hans Christian Anderson’s eponymous fairytale, the collection is rich in irony and explores the idea of illusion through its use of over-grown gemstone forms and enamelling to give the appearance of the real deal. “As a jeweller who has always preferred to concentrate on unique design rather than carat weight, the Emperor’s New Clothes collection was in my mind a particularly apt representation of my on-going desire to subvert the visual norm through humour and juxtaposition, thereby creating a world where record-breaking sized stones are affordable to all,” explains Tessa. 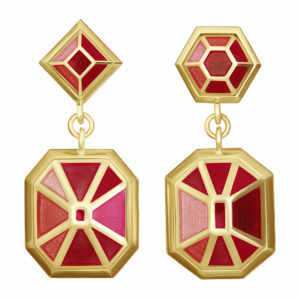 Re-purposing traditional jewellery techniques to create news-worthy sized gemstones in a variety of styles was a challenge that Tessa had long hoped to explore and one that is arguably very in-keeping with her often playful, tongue-in-cheek aesthetic. 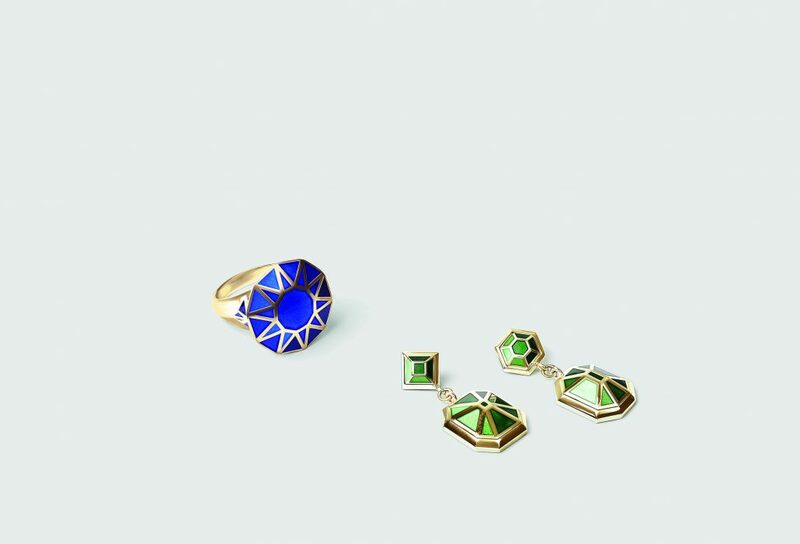 This focus on the ‘design element’ in jewellery, rather than the importance of a high carat weight presence in her pieces, tied in perfectly with the idea of working metal and enamel in such a way to create enormous diamonds, emeralds, sapphires and rubies. Emperor’s New Clothes utilises a variety of metals, materials and techniques, including 18ct yellow gold and gold vermeil, silver, hand-painted enamel work, intricate pave-set gemstones and larger set gemstones – the latter two being a further play on the idea of the real versus the unreal, illusion versus truth. Perhaps the most notable feature is the designer’s exploration of enamel work, recently experimented with in her Lost and Found collection. 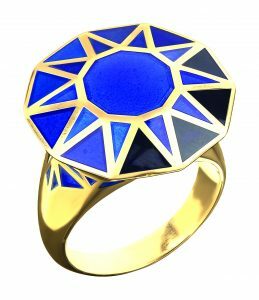 Here, flat planes of coloured paint are intricately hand-painted in painstaking layers to carefully recreate the subtle nuances of light, colour, shape and tone seen in the facets of real gemstones. The collection includes weighty cocktail rings, Asscher-cut drop earrings, multi-faceted studs in a variety of fancy cuts and emerald-shaped cufflinks amongst others.